Would you like beautiful tile flooring installed in your bathroom? Tile flooring is essentially the perfect match for any bathroom remodeling project. Tiles are durable and have no problem with the conditions a flooring material experiences in a room like a bathroom. It doesn’t matter how you want to decorate your bathroom because you’ll always be able to find a tile color, tone or pattern that will work for you. Ceramic, Marble, Slate, Stone and more there are literally thousands of options for tiling your bathroom floor. Lonestar Home Solutions is a full service home remodeling contractor specializing in tile installations, more specifically, tile installations in bathrooms. Laying tile in your bathroom isn’t just the job for a contractor or any guy you can find with a truck and trowel. Laying tile is an art form and to install it beautifully everytime takes a trained eye and a very skilled hand. If you want your tile flooring to be flat and level then you’ll want to make sure you hire the contractor that actually cares that your floor is flat and level. While some contractors just see another tile job, we see a blank canvas for us to create a beautiful work of art in your bathroom. We will meticulously place every individual tile so your tile floor flows beautifully along the length of your bathroom. We take the time to make sure the corners are perfect, the edges are smooth and that the tiles lay flat. Experience and a lot of patience, literally. Installing tile perfectly can be a frustrating project, especially when you are following behind a bad framing crew, or working with a very uneven subfloor. Having a solid and perfectly flat sub-floor is ideal for your bathroom tile flooring installation and will ensure a uniform look for all the tiles. Any experienced (and good) tile mason will put some work (possibly extensive work) into your sub-floor to ensure that you get a beautiful installation. Tile Flooring in Your Bathroom.What Makes A Great Looking Bathroom Tile Floor? The size and shape of the tiles also make a difference in how the finished project will look. An experienced tile mason such as Lonestar Home Solutions can help you choose appropriate tile for your project and bring up points of consideration in the planning phase that you might have never even thought of yet. What Makes A Great Bathroom Tile Floor Even Better? One of the most common complaints about bathroom tile flooring is that it’s cold on the homeowners feet. This is very true and exaggerated even more if your tile floor is on a cement slab or the ground floor. How do you fix this? By installing a radiant heated flooring system. If you’ve ever felt the soothing warmth of heated tiles beneath your feet you’d know it’s a luxury you’d never want to be without again! Most homeowners are surpised to find out this little luxury isn’t a budget breaker either and won’t add a staggering amount to your project cost. The best time to add radiant heating to your floors is when you’re upgrading because it’s a big job to do later if you have to rip up the floor to get it done. 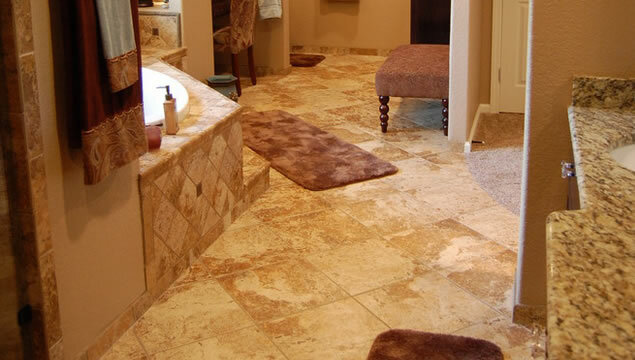 Why Hire Lonestar Home Solutions For Your Bathroom Tile Floor? We understand that you have many choices when it comes to a tile installation contractor in the Seguin area. We just want you to know that when you choose Lonestar Home Solutions to complete your tiled bathroom flooring project you’re partnering with a team of craftsman who want nothing more than to leave you with a beautiful new bathroom floor.